After two years of uncertainty and instability, the State Bar slowly is beginning to reinstate programs and services with an anticipated influx of funding in 2000. Bar officials are being careful to avoid reconstructing a bureaucracy that former Gov. Pete Wilson characterized as bloated and arrogant, instead focusing on using member dues cautiously and efficiently. They do hope, however, that the discipline operation, partially resuscitated this year with the help of a court-ordered special assessment, will be fully operational before the end of 2000. Also in the works are technological upgrades, including an improved and more user-friendly website, a revived fee arbitration program, eight updated consumer education pamphlets and programs to assist the legal services community. The board of governors hopes to hire a new executive director as well. "Overall, I look forward to having programs that will help us to meet our mission of improving the system of justice for the people of California," said bar president Andrew J. Guilford. "We will be looking at things like multidisciplinary practices, we'll be looking at MCLE, as a commission is doing now, and we'll be reinstituting programs that allow us to review and improve our ethical rules and other rules that help us meet our mission." Bar number crunchers face some uncertainties in knowing precisely how much money the organization will receive from its members next year. Attorneys are permitted to deduct $5 from the $395 dues if they object to any part of the bar's lobbying efforts, and no one is offering any predictions of how much revenue will be lost to that deduction. The board was not expected to finalize its legislative program until this month. In addition, the dues bill restructured income scaling, permitting attorneys who earn less than a certain amount to pay reduced fees. Some programs will try to generate their own in-come, but there is no way to know how successful those efforts will be. Despite an infusion of funds and personnel, the State Bar's discipline system is still struggling to resume full operations. In his third report to the Supreme Court since being appointed to oversee a special assessment to finance the discipline office, special master Justice Elwood Lui said the system "continues to struggle with the consequences of its financial crisis and virtual shutdown last year." 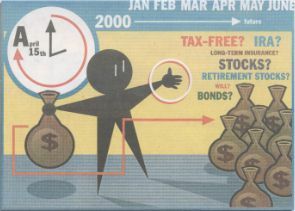 As 1999 draws to a close, you might be wondering what last-minute steps to take to reduce your tax liability come April 15. It's not too late to start making some intelligent investments, get or invest in some tax credits and consider thoughtful retirement planning. STEP ONE. Take an inventory of your assets and debts and what you are invested in and how you hold title to your assets. Most people spend more time planning their vacation than they do reviewing their investments. The vast majority of portfolios I see when I meet with new clients have inappropriate or unsuitable investments. Some investors own "B" shares of funds and were told "there is no commission." But the internal fee you pay each year may well be higher than those of "A" shares with the up-front load or commission. Combined with the "B" shares' back-end load, the total cost might be more than that of purchasing the "A" shares.